Mechanical key switches, a single key life of up to 60 million operations, making it durable and reliable in your game. Non-conflict design full keyboard, allows you to press any number of keys simultaneously, ensuring your every command is registered and executed exactly and rapidly. With Rapoo's brand-new gaming chip V-power3, 32-bit ARM core, 60MHz running frequency and 1000 Hz USB report rate, the V720S gives you powerful control in your game. You can update the firmware program in the driver to optimise your keyboard performance. 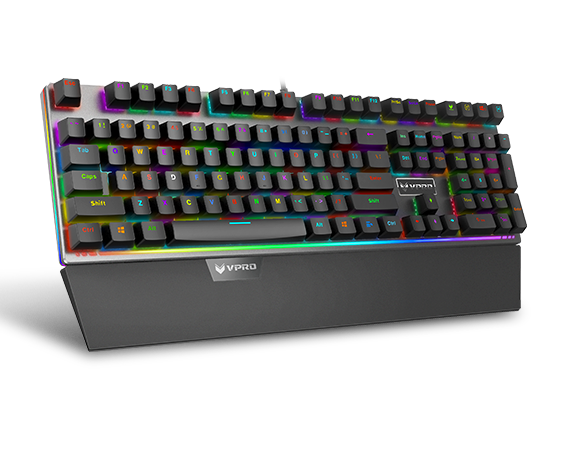 With RGB backlit,the all key's color and breathing mode can be customized by driver in the game mode.You can switch varities of backlight mode with VPRO combination keys in the office mode.